Handheld, Wireless, Portable, Industrial, USB, Bluetooth & More. IDCW supplies Barcode Readers, Magnetic Stripe Card Scanners and Point Of Sale equipment. Our wide range of branded barcode & smartcard scanners fit any budget & technical needs of our clients. For Smartcard readers go to Mifare Readers. Go beyond a simple scanning experience, and kick up your checkout presence to a whole new level. Utilizing a fresh approach to conventional bar code reading, your customers and employees alike will delight in its mastery of form and function. CiperLab continues to set the standards for cost-effective, work efficient scanning with the 1500 series scanners. These handy scanners simplify your business, enabling you to work smarter and deliver better customer service. CipherLab offers flexibility, productivity and value with it's 1500 series scanners. 3 year warranty. The MS5145 Eclipse is a single-line, hand-held laser scanner. Honeywells patented CodeGate technology allows the user to easily target the desired bar code and complete data transmission with a simple press of a button, making Eclipse a perfect selection for menu scanning, point-of-sale, document processing and inventory control. Xenon 1900, Honeywell's sixth-generation of area-imaging technology, is redefining the standard for hand-held scanners, and offers industry leading performance and reliability for a wide variety of applications that require the versatility of area-imaging technology. Adaptus Imaging Technology 6.0 delivers superior bar code scanning and digital image capture and incorporates a revolutionary decoding architecture that enables extended depth of field, faster reading, and improved scanning performance on poor quality bar codes. 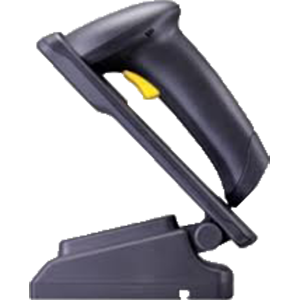 Honeywell's Voyager 1250g single-line laser scanner provides a superior out-of-box experience and aggressive reading of linear bar codes, including those up to 23 inches away. For users that require hands-free scanning, the easy-to-assemble Voyager 1250g stand increases throughput by incorporating automatic in-stand detection. Whether you need to scan printed bar codes on paper labels or mobile bar codes on the screen of a mobile phone, with the Motorola DS9208, you'll be ready. You get the versatility to scan any 1D or 2D bar code and all the features you need to keep your workers productive: industry-leading scanning speed; true point-and-shoot scanning simplicity - no need to align bar code and scanner; and hands-free and handheld flexibility. The Nexa LS-6150 represents the best value Laser Scanner on the market today. With autosense mode included handsfree stand stylish looks and long range the LS-6150 is ideal for most applications including small to medium retail and hospitality stores and document tracking applications. The Nexa NL-1800 breaks new ground in cordless scanning! Featuring an effortless plug and play receiver and a price point unrivalled by major competitors the NL-1800 makes cordless scanning more affordable than ever before. It also offers 100m line of sight range 60 000 scans per charge and the ability to keep sccanning while the battery is flat using the charging cable. The CM-500W Bluetooth is ideal for use with iPads iPhones Android tablets etc. for stocktaking document tracking and other portable scanning applications. When used with the iPad or iPhone you are able to keep using the onscreen keyboard with the simple touch of a button a feature many Bluetooth scanners don't have.